“What the city lacks right now is some overarching plan.” That’s what Frederick’s new mayor, Michael O’Connor, said the other day, asking the public to weigh in on the findings of his Strategic Opportunities Advisory Team (SOAT). 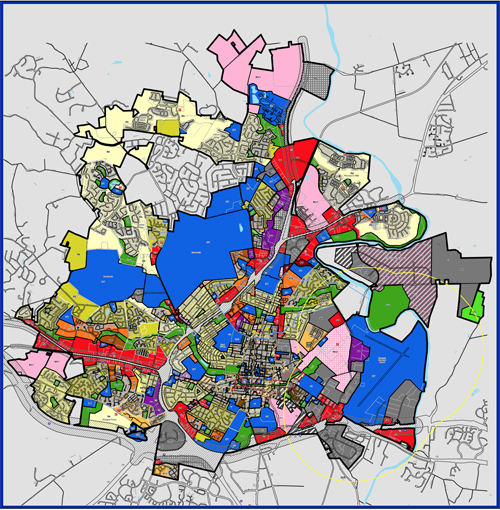 Essentially his transition steering committee, the team was tasked with looking at five different thematic areas and coming up with recommendations that could theoretically be incorporated in the aforementioned overarching plan, somewhat akin to the Livable Frederick process the county’s just been through. However, while Livable Frederick remains a fairly traditional master planning document at its core, addressing issues of land use and development, those topics rarely come up in the series of reports the SOAT’s five work groups produced — and then only in passing. The “Economic Resilience” work group, for instance, identifies “affordable workforce housing” as one of the city’s primary weaknesses and “traffic/transportation” as a threat (“cost of housing” crops up as a threat, too). Meanwhile, the “Expanding Opportunities” work group notes that “Frederick City’s lack of density and mixed-use, and pattern [of] outlying suburban development creates employment, food and services deserts.” But the solutions proffered are more Band-Aid than bold — boiling down to suggestions that the city pursue more state and federal money in order to expand the public transit network, increase affordable housing efforts and build/widen roads. What’s missing is any thinking to connect these various dots. Traffic is a mess, housing is expensive and people are isolated precisely because that’s baked into the formula Frederick’s been following for a couple of generations. After almost two centuries of compact, walkable development based on Daniel Dulany’s original street grid, the post-WWII pattern has left Frederick’s core more or less ringed with low-density, single-use suburbia where getting almost anywhere requires getting in a car (and even theoretically dense town house and apartment developments are largely isolated in the single-use islands that their zoning requires). All this comes at tremendous cost. First, there is the expensive infrastructure — mile upon mile of roads and pipe — that knit the city’s far-flung parts together (and when it comes to “economic resilience,” the low-density development it services may not generate enough tax revenue to cover its upkeep). Second, there’s the cost that citizens pay in order to function day to day: Your mileage may vary, but according to AAA, the average ownership cost per car — including fuel, insurance and maintenance — is about $8,500 a year. Improved transit can mitigate some of those challenges, but will never be an optimal solution in a low-density suburban environment. And widening roads and adding parking to alleviate traffic will only exacerbate the problems brought on by dispersion. So if we truly want to build an economically resilient community with expanded opportunity for all citizens, we should consider increasing walkability and, in many cases, density to better utilize the city’s existing infrastructure. Reduce regulatory barriers to infill development. Realize that surface parking represents a vast amount of untapped real estate. Transform our single-use, single-story commercial corridors into mixed-use districts that can provide transit-accessible affordable housing. And most of all, let people — not driving — shape our land-use decisions.